A long-haired elven woman sighs as she enters her house, the weight of the day visibly pressing her down toward the earth. “This can’t keep going.” After pouring a drink she sinks into the couch, looks toward her fantasy tv and turns on her fantasy console before she starts to play. Apparently this isn’t what people mean when they describe fantasy consoles. In recent years a dedicated scene has grown to build and support the best consoles that never existed. None of these restrictions have slowed the indie community’s adoption of these fantasy consoles either, there are nearly 2000 finished games uploaded to Pico-8’s site and we’ve got over 400 in our tag for the console. There is even a zine dedicated to the console’s games and community. But Pico-8 isn’t the only pillar in the scene. 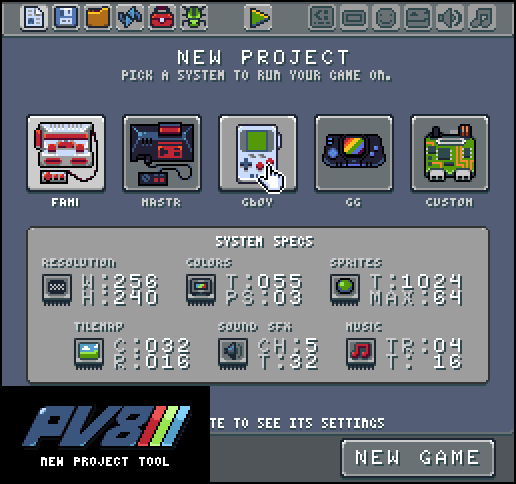 Pixelvision 8 is both fantasy console and fantasy console development platform. Sure you can develop games in the environments of consoles of history but you can also set your own limitations all the way down to the technical level. There are also consoles that have modified the tightly limited environments of the Pico-8 like the TIC-80 which appears to be going open source soon. Recently, fantasy consoles have begun to escape their status as purely fantasy by making leaps into the real world. With the launch of the PocketCHIP. Pico-8 developers now have a device that they can create and play games on outside of their computer. Furthermore, enterprising developers have been working to get fantasy consoles working on raspberry pi boards (Pico-8 is already supported) so the games can be played on a variety of screens. While working under limitations might sound frustrating to some, there are games that are starting to reach into broader audiences than just the dedicated fantasy console scene. Mattmakesgames’ upcoming platformer Celeste originally started as a Pico-8 game and indie mastermind Terry Cavanagh has used the platform in the past. But why should you as a player care about fantasy consoles? With such tight constraints developers have to key-in to exactly what their game is and you get to reap the benefits. It’s great to see games that know what they’re about-- do one thing, and do it well. It’s also easy to get involved playing fantasy consoles. With the obvious inspiration from consoles of the 80s, the requirements to run games developed on these consoles have dramatically low requirements. It’s hard to imagine a modern computer that can’t run these consoles. There has never been a better time to get into fantasy consoles. The scene is growing every day and with a significant back catalog of content, you could be playing games forever. There are others, too. Unfortunately, many of them appear to be just Pico-8 clones with more generous limits. But I'm thinking... couldn't these fantasy consoles with their tight limits and built-in IDEs help beginning game developers get their feet wet the same way 8-bit computers used to?